I may have mentioned before that I’m not much of a girly girl. My wardrobe is limited and my makeup routine is even more pathetic. It’s not that I don’t enjoy these things because, like most women, I do enjoy the occasional excuse to put on a snazzy outfit and an extra coat of mascara. But when you’re in a hot kitchen all day, that mascara could mean opening an oven and having your eyes sealed shut. I do try to keep up on beauty and fashion though, just in case. I subscribe to Birchbox and follow a handful blogs and Instagram accounts with inspiring beauty content, but I find that I’m more interested in beauty accessories and bath products than straight up makeup. Maybe it’s because I wear so little myself, but I do take baths and brush my hair, so products that fall into this category seem to hold more use value for me personally. But just like traditional makeup, this is an over saturated market area. There is just so much out there. 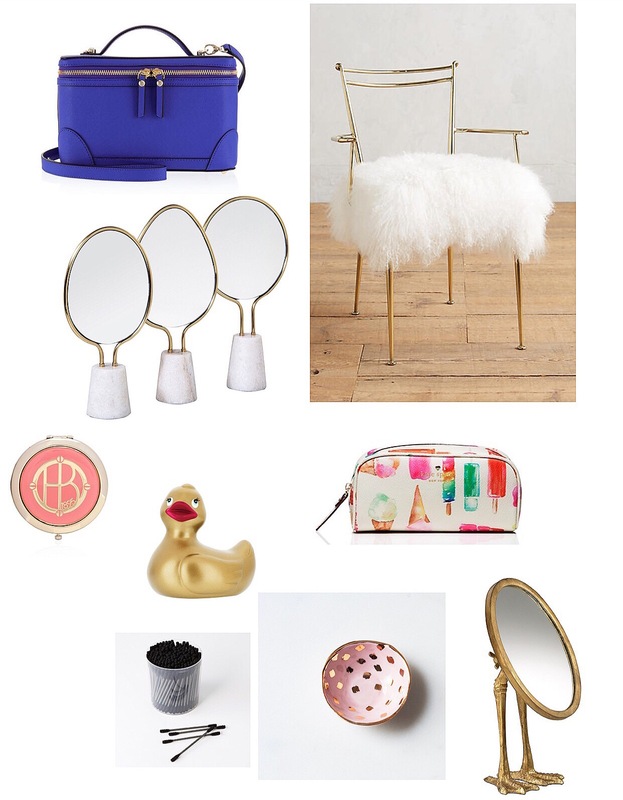 So I’ve rounded up the most luxurious, bordering on ridiculous, dream bath and beauty accessories I could find. Imagine having one of those closets with a huge vanity and tons of built-ins to house all sorts of magical bits and bobs. In my mind, these are the products you would find there. Although I probably wouldn’t buy that much brass or gold for one space, I love the thought of each of these items individually. Plus, most of them aren’t crazy expensive! Ok, there are a few that would wipe out my savings account (like that shag dressing chair that I would sell a kidney to have), but the remainder come with a relatively small amount of sticker shock. I think the dilemma here isn’t “Can I spend $50 on that?”, it’s “Should I spend $50 on a razor?”. Or perhaps, “Do I need gold toothpaste?”. But you can answer those questions yourself. As for me, I’ll just wait for the day when my bathroom is bigger than a 10″ square.